Kassa Korley gets 3rd IM norm…title! IM Kassa Korley at 2014 World Open. FM Kassa Korley just earned his third International Master norm and thus qualified for the title. His ELO rating already exceeds the minimum 2400 requirement. The Duke collegiate recently finished a study aboard program in Denmark and tallied strong results in Danish tournaments including a 6/7 score at Kandidatklassen where he earned 32 ELO points. It seems only yesterday that Korley was rising quickly through the Master ranks and he has done so without the aid of a coach or trainer. This gives testament to his tremendous work ethic. Watching him analyze is probably one of the most obvious ways to get a glimpse at his sharp style of play. 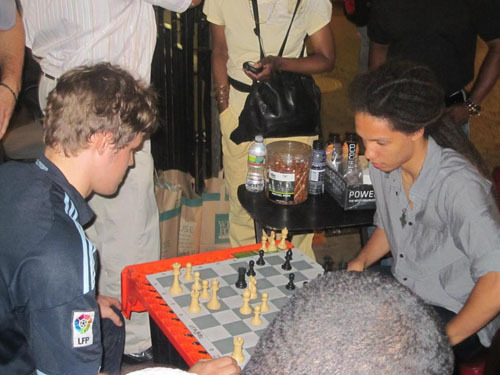 Kassa Korley sparring with Magnus Carlsen. Having earned his first norm at the New York International in 2011, his second norm at the same tournament a couple of weeks ago, Korley earned his third and final norm at the DC International last weekend with an impressive 6/9. This has been a great 2014 for Korley and he will be able to enter his fourth year at Duke with a lot to share about his summer months. Congratulations to you and family, may you continue to grow all of your talents! Congratulation! It is good to see Kassa enjoy chess along with his academic pursuits. 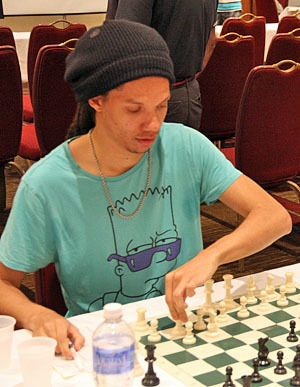 Congratulations from the Jamaican chess fraternity. Now on to the GM title! Great news! Congratulation IM Kassa! who won between korley and carlsen? It doesn’t appear that he needs it, but it is always nice to have an extra one in your pocket in case some technical challenge to a prior norm is raised with/by the FIDE QC. Congrats Kassa on another major milestone in your chess career.